Here you will find an abundance of possibilities, something for every person of any age, for every type of vacation, for every budget. Make your dream vacation come true. From south of Cancun down through Tulum, you will be able to fulfill your yearning for a unique getaway with memorable activities. There are loads of different activities in the Mayan Riviera and choices to suit everyone and every interest. Whether you are staying in Playa del Carmen or elsewhere in Cancun or the Mayan Riviera, there are opportunities to make memories! Travelling with kids? 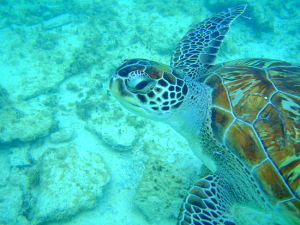 Check out our list of activities for kids in the Riviera Maya. The lush jungle that surrounds the area is the perfect setting for adventures. 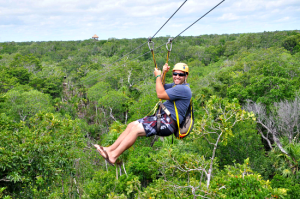 Adrenaline junkies will be pleased with the options for zip lining in the Riviera Maya: Xplor Park, Alltournative Off Track Adventures, Xtreme tours and more. The Mayan Ruins will fascinate even those not so history-orientated. Take in one of the Seven Wonders of the World, with a visit to Chichen Itza. If you want to climb the pyramid, why not try Coba‘s 120 steps to the top? You can rent a bicycle for a small fee and explore the paths and structures hidden throughout the jungle. Want to say you saw the ruins, without devoting a whole day? Opt for Tulum. Set on a cliffside next to the turquoise ocean, the scenery will take your breathe away. The Meso American Barrier Reef, the 2nd longest coral reef in the world, runs all along the coast of Mayan Riviera offering fabulous snorkelling and scuba diving. You can even snorkel with giant sea turtles. The Sian Ka’an biosphere is a great option to observe nature at its best. Wild dolphins, sea turtles, crocodiles, birds galore, snorkelling and depending on the season, you may even see some manatees. Love the nightlife? 12th Street in Playa del Carmen is the place to be. Nightly fire dancers at the beach at the Blue Parrot, the renowned Coco Bongo shows, or the rooftop terrace at Mandala. Romantic getaway? Why not try the adults-only Columbus dinner cruise on the Nichupte Lagoon in Cancun? Delicious meal, live music, open bar and you can choose to sail during sunset or even under the stars. 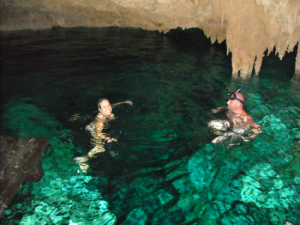 Cenotes are abundant in the Yucatan peninsula and this amazing experience is one you won’t want to miss. Clean, fresh, clear water in sink holes that you can swim, snorkel and dive in. Not sure what to choose? Give us a ring at 1-888-537-9797 and let us help you find the right activity. We also offer discounts on many of the tours in Cancun and the Mayan Riviera.